How did an Earth rock land on the moon? In 1971, astronauts from the Apollo 14 space mission collected rocks from the moon. They brought these rocks back for scientists for scientists to learn more about the surface of the moon. What they did not realize was that one of these rocks contained particles similar to those found here on Earth. Furthermore, they have dated the age of one particular rock at 4.1 billion years old. How did it get to the moon? Four billion years ago the solar system surrounding the Earth looked much different. The moon’s distance was three times closer to the Earth and asteroids bombarded the surface. Scientists believe that those impacts may have left 20,000 kg of Earth material covering 100 square kilometers on the moon. A recent report in the scientific journal Earth and Planetary Science Letters states that one rock sample collected on the Apollo mission consists of materials found here on Earth. For example, the rock contains quartz, feldspar, and zircon. These materials frequently appear on Earth but are “highly unusual on the Moon.” According to the analysis, this rock formed somewhere between 4 and 4.1 billion years ago, about 12.4 miles beneath the Earth’s crust. The scientists added that it’s possible the sample was crystallized on the Moon, but “that would require conditions never before inferred from lunar samples.” Furthermore, the rocks would have been created at a tremendous depth. Scientists believe that the rock was impacted again, once it reached the lunar surface. Why do they think this? It was partially melted, buried and then excavated by another impact approximately 26 million years ago. How did scientists find the one rock, brought back from the moon, that matched elements here on Earth? This would seem impossible if they only brought back one rock. However, the mission completed by Alan B. Shepard, Jr., the commander; Stuart A. Roosa, the command module pilot; and Edgar D. Mitchell, the lunar module pilot brought back much more than one rock. 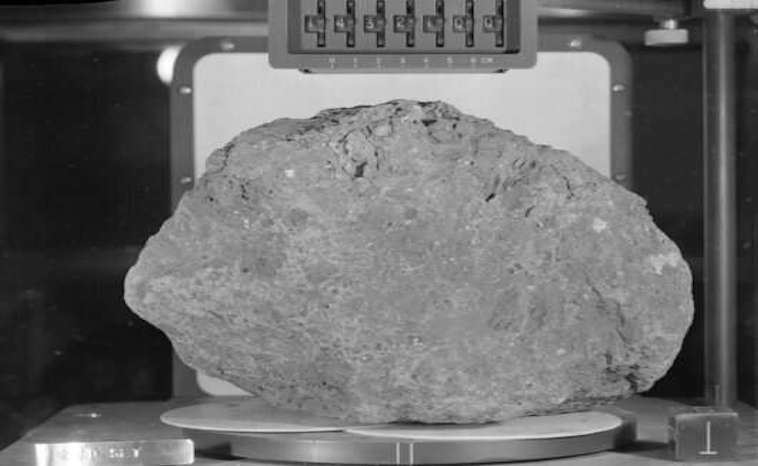 With the vast amount of travels across the moon surface and the collection of so much material, we can see how they have collected a sample of an Earth rock. It has taken scientists over 45 years to reach this conclusion after waiting for advancements in geologic technology. Now they will have the ability to look at more of the lunar samples and see if they have more evidence of these types of rocks. It will be interesting to see what else they discover. Is Jupiter’s Giant Red Spot Getting Smaller?